Ask a tequila enthusiast about the best of the best, and the word “Añejo” may leap to the tip of the tongue. Don’t waste Anaya Añejo on mixed drinks. Let it stand alone, and enjoy it in all its glory. Silky smooth, aged to perfection, and possessed of a clean agave taste with gentle, subtle hints of something just a touch more sophisticated, as well as a fleeting finish. Añejo invites you to sit back and savor. Smooth agave flavor without the burn. Hints of oak, coffee, and chocolate. Anaya Añejo ages for 16 months in Jack Daniel’s whiskey oak barrels from the heart of Tennessee, fusing these flavors to perfection until one slides sensuously into the other. A marriage of two fine traditions and a legacy of exacting artisanship, Anaya Añejo liquid amber swirling slowly in the glass, offering true sipping perfection. 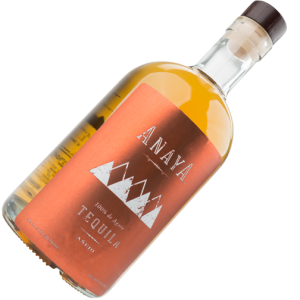 Anaya Añejo doesn’t include any added sugar, coloring, or other additives. It’s made from pure agave harvested from the Jalisco highlands, created from the purest of processes. If it doesn’t taste exactly as it should we don’t bottle it, just so your mouth starts to water in anticipation from the moment you reach for the bottle. Drink it neat and sip at room temperature—never add ice. Don’t waste it in a mixed drink. If you must add something to it, pair with a lovely sangrita, served on the side. Anaya Añejo is all about the love…love for the agave, love for the authentic. This is no dabbler’s drink. It’s the libation for those who are ready to take a little time for themselves, who know what they like and, moreover, know what they deserve. It’s the perfect ending to a long, hard day or the perfect beginning to a night of steamy romance. Those who are ready for the quintessential tequila experience.